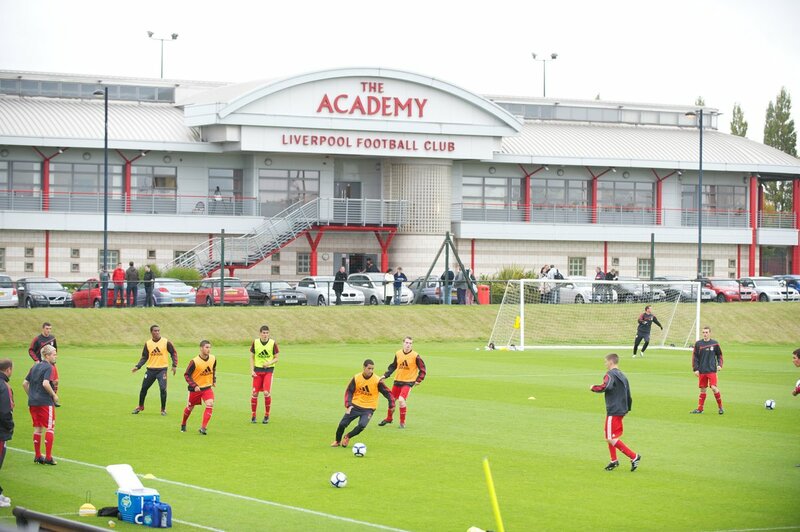 The Liverpool Academy - LFChistory - Stats galore for Liverpool FC! The two main targets of Liverpool F.C.’s Academy, which in its previous life went under the title of School of Excellence, are the same today as when its doors opened in 1998 … “to implement a common style of play in teams through all categories, and to provide players for the first team.” The idea behind it was to allow the club’s training facility at Melwood to be used solely for first-team matters with the new facility at Kirkby being used for the club’s younger players, the ideal being that one day the best of those youngsters would be ready to make the step up to Melwood around the time when they would be offered their first professional contract. Rob Jones very kindly invited LFChistory.net to join him at the Liverpool Academy in Kirkby where he currently works as a mentor to the youngsters. Former teammates of Rob; Steve McManaman and Robbie Fowler also have enjoyed similar roles at the academy for the past three years. I had never visited the Liverpool academy before. Therefore, as well as meeting up with one of the top players of the Liverpool side I supported whilst I was growing up I was greeted with the added bonus of visiting a place where so many Liverpool greats had started off their football careers. As we enjoyed a quiet stroll around the academy, some players started to arrive, it must have been the under 7s or thereabouts, holding their dads' hands and fully kitted out in their red Liverpool FC kits. The thought of the possibility of the next Steven Gerrard had just walked passed me popped into my mind. The facilities looked amazing, everything spotlessly clean and brand new. I was itching to get on one of the green astroturf pitches for a-kick-about; however, by doing this, my morning would have undoubtedly been ended before it had started. Even the smell of the hot dogs coming from the burger van smelt better than usual. We made our way into the main building. The kids are quickly reminded of who they are playing for or against, as the first sight they are greeted with on entering is a replica of the European Cup. Not to mention, the quantity of Liverpool legends who are on view. If this welcome doesn't inspire you then I don't know what will! Anyway, as we were waiting for Rob Jones, one of the young lads arrived and was greeted by the receptionist. "Morning George, you're in with Kenny Dalglish today". My heart suddenly skipped a beat; "King Kenny is here?” I quickly, followed the 7-year-old down the corridor to see where he was heading and there he was, Kenny Dalglish, painted on the front of the changing room door. Of course, they name the dressing rooms at the academy after Liverpool Legends. I then looked round and saw the others. The Bill Shankly changing room and further down I spotted the Steven Gerrard and Bob Paisley changing room among more Liverpool icons who contributed so much to the history of our unique club. I certainly got the feeling that the players at the academy are being constantly reminded of what the club has achieved and who it was achieved by from a very young age. The club has a widely-spread network of scouts, especially locally. These scouts regularly watch youth football matches trying to spot the stars of the future. The boys who impress the most can be invited to attend training sessions at Kirkby and this is what happened to three of the club’s most well-known players … Steven Gerrard, Jamie Carragher and Michael Owen … who began training with LFC when they were only eight, nine and ten years old respectively. So that their education is not disrupted, the boys’ early affiliation with the club is restricted to after-school training. But once they have reached the age at which their secondary education would normally begin, the academy has the facilities in place to cover their academic needs as well as their sporting needs. Every match played at the academy is recorded for later analysis. The recording includes the coaches’ voices, an innovation introduced following research by the local university which suggested that oral communication was very important in the boys’ development. Parents are encouraged to watch their children play in such matches with the proviso that they are kept away from the pitch to avoid the sort of touchline behaviour that is sadly so prevalent amongst parents who watch their children play at amateur level. Progress can be rapid for a boy who proves that he has all the necessary attributes to become a professional footballer. Parents discuss their child’s progress with academy staff a few times each year. Of course the dream is that their kids will make it but the reality is that most won’t. Carl and one of the best right-backs in Liverpool's history, Rob Jones. The role of a mentor is primarily based on giving advice and instilling determination and dedication into the youngsters. For instance, Rob would just simply sit down for lunch with the players before games and give them inspirational guidance and tips on the forthcoming encounter. These players know exactly what it takes to reach the very top; Rob, Steve and Robbie have all represented England and had successful careers at Liverpool and elsewhere. Therefore, their sheer presence around the academy will be more than enough to benefit the inspiring young Reds. At the Academy I sat down with Rob Jones to discuss his eventful career and that fascinating talk will soon be published on LFChistory.net.